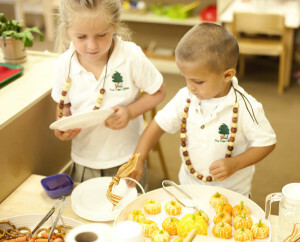 How is a Montessori program different from other school options? In most traditional schools, the children are taught educational concepts in a group by a teacher. In a Montessori program, the children work at their own pace, independently learning concepts from multi-sensory materials designed for self-correction and physical exploration. Why is an early childhood education so important? The Montessori classroom is a child-sized world. Whatever is in the world outside can be incorporated meaningfully into the Montessori classroom. To the young child, the world is unmanageable–it is too big, too complex, and too confusing. By careful selection of materials by the teacher, an environment is set up which allows the child a place to explore life on a level she can understand. The materials and exercises are designed to stimulate independent exploration. This prepared environment entices the child to proceed at her own pace, from simple to more complex activities. Through this process, her natural curiosity is satisfied, and she begins to experience the joy of discovering the world around her. Materials and curricula center around practical life, censorial, mathematics, language, geography, history, science, art, music, drama, and perceptual motor development. The Montessori method is an approach to learning, and as such, has no distinction of class or intelligence. It has been used successfully with children between the ages of 2 1/2 and 18, in all parts of the world, from all socioeconomic levels representing the average, gifted, and special needs child. It is not associated with any particular religious persuasion. Tuition in Montessori programs throughout the country tends to be higher than in other programs because of the extensive materials, encompassing environment, balanced curriculum and highly trained staff. It is, however, a very reasonable cost in contrast to other activities you would plan for yourself or your child. To give your child the finest possible experience in his most sensitive years is to give him a strong foundation throughout his life, and probably ward off investment, later, to correct or remedy that which was missed. Many educators believe it is a wise decision to invest in a child’s preschool education because the child who enjoys learning and becomes self-directed at the critical preschool age, will benefit through all his years of learning. Please note: The Tree House strives to have an inclusive, richly diverse student population with children from all socio-economic strata so the tuition rates are much lower than what other Montessori schools of comparable quality charge. A Google search of schools across the country is an easy way to verify this. Parents may go to AMI-USA: www.montessori-ami.org for this information. Montessori is not a closed or static system of education. While there are certain materials and methods that have been proven effective through many years of use, Montessori is as much an attitude about education and children, as it is a specific method. Do you expect parental involvement in the program? By being a parent of The Tree House, you are automatically a member of our parent organization, “The Mighty Oaks” where each parent is asked to participate and support school efforts through fundraising, class holiday parties, observations, conferences, parent evenings, and other special events. The more parents participate, the better able they are to follow through at home. When parents follow through at home, the child benefits even more because she has a consistent environment in which to grow and develop as a secure, well-adjusted human being. What can I read to familiarize myself with Montessori philosophy? What are some other books not written by Montessorians that support this philosophy? Anything written by Alfie Kohn….